Happy New Year, everyone! My best wishes to you for a happy, healthy and prosperous 2008! 1) Get on the radio WAY more often than I did in 2007. 2) Operate portable a lot more than I did in 2007, once the weather gets nicer, that is! 3) Keep this blog better updated with my experiences and happenings. 4) Finish a kit or other radio project or two. 5) Re-do the radials to my Butternut HF9V this Spring. 6) Keep my Web page updated and fresh. 7) Work Alaska and finally finish WAS QRP CW. 8) Become an SKCC Centurion. 9) Complete QRP DXCC (only 30 to go). It will be interesting to see 366 days from now (Yes, this is a Leap Year) how I did. Until the next post, keep happy, healthy and safe! Remember the days when you could get a nice sized TV (about 26 or 27 inches) for a couple of hundred bucks? Them days seem to be over! Our television in the living room was on its last legs. Intermittently, it would turn itself off and back on. Very annoying when you're trying to watch something interesting. A few years ago, I'd have run out to Circuit City or Best Buy and would have picked up a replacement for maybe somewhere between $200 - $300. First off, it's hard to even FIND a TV like the kind that used to be prevalent. Today, everything seems to be either LCD, plasma or projection. Secondly, the selection of TVs in the range of 26 to 27 inches is limited. Oh sure, it's incredibly easy to find something that will fit your entire wall; but there's also a man sitting next to those TVs who helps you fill out second mortgage papers! Circuit City had just finished running a sale this week and they were all out of stock. A run across the highway to Best Buy led to me finding an 26" LCD by Westinghouse. Why my obsession with a 26 or 27" TV? Because anything bigger than that will not fit the pre-existing entertainment center; and for what I paid for that, I'm not about ready to get rid of it just yet! Bringing it home and hooking it up was a piece of cake. I am a Direct TV subscriber but don't have the HD dish just yet. I plugged in the standard satellite connection, and while it's not HD it still looks better than the CRT TV that we had. This coming summer, just maybe I'll break down and get the HD dish installed along with the service. For now, the picture is fine. Heck, I don't watch all tha much TV, anyway. I'm usually way too busy doing something else. But still, the price had me in sticker shock. I paid as much for this TV as I did for my K2. Hey, at least with the K2, I can talk around the world. Can't do THAT with an LCD TV ! So much for waiting ! OK, so the resolution was to get on for SKN and get back in the habit of getting on the air on a regular basis. I guess I got so inspired by my own post that I didn't bother to wait. I went down to the basement and flicked on the K2. Both 40 and 80 Meters were beautiful! Not many stations heard; but the background noise was at a minimum. Even the weaker stations sounded pretty loud! In a little while I had that satisfied feeling. My code speed doesn't seem to have suffered from my lay off from radio, my K2 and G5RV and HF9V vertical all seem to be working; and all seems to be right with the Ham Radio world. You know, you get out of the habit of getting on the air and you miss out on just how much fun this all is. The magic is still there for me. In the blink of an eye, my radio waves are jumping out from my antenna, being heard and answers are being sent to me in mere seconds. It would take days to drive that far. How cool is all this ! The bug has bitten once again; and I am once more infected. It's a wonderful thing. Monday is New Year's Eve. That means Monday night at 7:00 PM EDT is the start of Straight Key Night. This event will hopefully be my launching pad to more operating time in 2008. My new job, which I began last April really has sucked away a lot of my operating time. The job is a lot more involved than my old one; and as a result, I come home a lot more tired than I used to. I let this allow me to get into the nasty habit of not getting on the air. I hereby resolve to turn this around in 2008, beginning with SKN. I'm not foolish enough to resolve to MOCAD (make one contact a day). I know that there will be days when I'm simply too exhausted to get on the air. But I am going to do my best to get on at least 5 times a week. minimum. So that means more involvement in QRP contesting like I used to do; and a lot more ragchewing as well. I need to use Ham Radio as a vehicle towards relaxation and a distraction form the ordinary worries of the day. It's a good prescription! 1) Finish QRP DXCC - I've been stuck at 69 countries for a long while now. 2) Finally earn SKCC Centurion status. I only need about 25 or so more QSOs with SKCC members. This will not only get me to Centurion; but it will earn the SKCC QRP award, too! 3) Finally work Alaska! That's the last state I need for QRP Worked All States. Happy New Year and hope to work YOU on the air in 2008! for a very Merry and Blessed Christmas. May you enjoy the loving embrace of family and friends. that the Christ Child was born to bring. 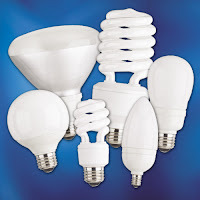 CFLs - good news and bad. One of the indoor floods that makes up one of our three kitchen ceiling lights went out the other day. I went to the local supermarket to buy a few needed items as well as a replacement bulb. The type of bulb I needed looks like the one to the extreme left and top in the photo. Much to my dismay, the store was out of "normal" incandescent lamps. All they had were compact fluorescent lamps or CFLs. I have dreaded using these in the house because I've heard the horror stories that some Hams have experienced. I have read on the QRP reflectors that some of these lamps are the worst RFI generators this side of the Russian Woodpecker. It was either walk around in a dark kitchen or bite the bullet; so I decided to bite the bullet. I bought three to replace all three fixtures in the kitchen. It turned out that they were only a couple of bucks more expensive than what I would pay for a "normal" lamp; so, so far so good! And if you believe the packaging, each lamp gives off the equivalent of a 65 Watt incandescent lamp; but only consumes 16 Watts of power in the process. So if you do the math, it works out that ALL three lamps will use less electricity than just one of the older style lamps that I had been using. In addition, based on an average of being on for 3 to 4 hours a day, these little wonders are supposed to last for three years. The good news is that after I installed them, I ran downstairs to the shack and turned on the K2 and noticed NO detectable hash, noise or other trash on 80, 40 or 20 Meters. The ones I has purchased are really electrically quiet. Maybe because they are made by Phillips, which is a pretty reliable company. Maybe it's because they aren't "el-cheapo" no named "10 for 5 bucks" bargain brand lamps. Whatever the reason, I am glad they seem to be RFI free. The bad news? I hate the light they give off! They're plenty bright enough - no problem there. The light however, is a cold and somewhat harsher light than the warm, soft yellowish glow that I have come to expect from "normal" incandescent lamps. Also, when you turn them on for the first time after they've been off for a while they are dim until they warm up. When you wake up at 6:00 AM in the Winter and it's dark outside; it's nice to be greeted by the warm, steady comforting glow of regular light bulbs. This dim for a few minute thing is going to take some getting used to. Lastly, I've discovered that you cannot just throw these babies out when they finally go kaput. Unh-unh. These little demons contain mercury and must be recycled or turned into somewhere where they accept hazardous household waste. Wonderful! Now I'm going to have to take these to a County facility when they eventually give up the ghost. Luckily for me however, is that one of the County sites is right here in South Plainfield. I suppose this is a small sacrifice to go a little "green" (you have no idea how much I hate that phrase!). However, I've been reading that in the next few years that new rage will be light bulbs that use LED technology. I just hope the LED bulbs will be made slightly more warmer and comforting than what they've come up with so far for these CFLs. Call me old fashioned or an old fogey; but a light bulb is supposed to be a light bulb. Why mess around with something that has worked perfectly well for over 100 years? I know that I've been extremely bad in not making any new postings in about two months! I apologize for that by stating that life here in the W2LJ household has been in a state of flux lately; and that there hasn't been any time for radio. However, things will be getting back to normal soon - mind you, things haven't been bad here - just different. I don't want to go into detail; just suffice it to say the situation should be returning to more of a normal mode very soon. However, I wanted to take a few moments to wish all my friends, Ham radio and otherwise, as well as those of you who have been regular readers in the past, a very Happy Thanksgiving. We all have a lot to be grateful for. Friends, family, jobs, hobbies and homes round out just some of the good things that surround us. God has been very good to us as individuals and as a Nation. No matter how bad it might seem at times, the Almighty still looks out for us and continues to watch over our lives, prosperity and freedom. He has been VERY good to us; and it is fitting that we set aside this day to bow our heads and offer a prayer of thanks. Some of the more secular in society think the day should be spent by giving thanks to the Indians for helping out the Pilgrims or some such other nonsense like that. No, plain and simple the day was meant to humble ourselves and give thanks to God for the wonderful bounty he has given and continues to give us. Personally, I am most grateful for my wife and kids, my Mom and my sister and her family, my wife's family, my many Ham radio friends and acquaintances, my home, my job, this wonderful Country and its Constitution, as well as our magnificent Armed Forces who volunteer everything to keep us free! I will go on bended knee to thank God for everything He has given me. Without Him, I would have nothing; and I would be nothing. The secular atheists probably have a big problem with that kind of statement; but that's their problem! But, in addition to offering prayers of thanks, I would implore you to also put your Faith "where your mouth is", so to speak. Now that Christmastide will be upon us soon, it is so easy to forget the less fortunate among us during this crazy and busy time of year. The next time you go grocery shopping for your family, I would ask that you please consider buying a few bucks worth of non-perishable food items and take them to your local church, synagogue or food bank. There are many among us who lack even the basic necessities. There is no better way to express thanks for your bounty than by sharing it with those who are in need. We Christians are reminded that Jesus once said that "The least you do for the least of your brothers and sisters, you also do for Me". Amen! Once again, Happy Thanksgiving everyone! Turnout for the NJQRP Homebrewer Sprint on Sunday night was light. I half expected that. Crummy band conditions and non-existant propagation made for light turnout. For the time that I was able to be on, I made about 8 QSOs in approximately 90 minutes of activity. I packed it in when I reached the point where a 20 minute CQ session had netted Zero; and everyone I could search and pounce was someone I had worked already. The usual suspects were present - N4BP, K4BAI, WA3OFF, AF4LQ and WØUFO among others. These ops have become good friends/acquaintances from meeting them on the air many times in other QRP sprints.. It is an honor and a pleasure to know them. From the log entries, I've received so far, my puny QSO total is more the rule rather than the exception. Soapbox comments bemoan the lack of activity as well as the lack of propagation. I suspect the two are in a cause and effect relationship. Turnout will increase once the bands start getting better. I'm now in the process of printing out certificates for the winners of the Spring 2007 event. Yeah, I know I'm late; but I have so many irons in the fire. I'm glad I'm getting them out now! I'll do better with the Fall results. The prototype certificate appears above. I still have to figure out how I'm going to place the certificate holder's name and call sign, along with the date; and my signature (as Contest Manager). Hopefully, the recipients will enjoy receiving and displaying these. Boy, it seems and feels like forever since I've been on the radio; or much had time to even think about radio! Summer activities; then Back-To-School activities and the resumption of other projects have kept me off the air. I scratch my head when I think about how I made a QSO every day for a solid year a few years back. I look at K3WWP's streak and I'm even more amazed. How did I do that? How does John continue to do it? I was never a big John Lennon fan (although I did love the Beatles); but he was spot on when he said, "Life is what happens while you're busy making other plans". Tonight, however, I'm looking forward to heading down the basement to get on the air for a while after the kids are in bed for the night. My wife Marianne is working until about Midnight; so I should have an hour or two of quiet time after bedtime and then the compulsory "picking up after the kids" is done for the night. Geez, I hope 40 Meters is decent tonight! And I hope the bands are decent for tomorrow night! Don't forget the NJQRP Homebrewer Sprint tomorrow night - please find a way to get on, even if it's for a little bit to hand out some QSOs. The care and feeding of this Sprint was handed over to me by Ken Newman N2CQ about a year ago. Participation has been dwindling the past few years. I would appreciate the help in bringing it back to life again! Hey, just the anticipation over it has gotten my fire re-kindled; and I'm once again looking forward to getting on the air. Hope to hear you there. NJQRP Homebrewer Sprint this Sunday night! It's that time of year, again! Time for the Fall edition of the NJQRP Homebrewer Sprint. It will be held this Sunday night (Monday morning UTC time). So put on your headphones, grab your key and come join us for a spell. Work a half-hour, work an hour, work all four! The point is to join in and have some fun! This time, however, this will be a CW ONLY event, due to the lack of PSK-31 entries. Mission: Promote homebrewed & homemade equipment on the air together. Kits are considered homebrew. Anyone with ANY equipment can enter; and is highly encouraged to do so! Modes: CW only, starting this edition, QRP friendly frequencies recommended on 80, 40, 20, 15 and 10 meters. Awards: Awards: Special certificates will be awarded. Logs: Entries must be received by 30 days from the contest. The log sheets and summary should be included. E-mail logs are accepted in text form. (No word processor files etc). Also paper logs are ok. Include an SASE or E-mail address for the results, if desired. Please include your Soapbox info with your equipment and exploits. This is my entry for the HB Sprint on Sunday night 3-25-07. This is my 1st effort in the event. I had some free time Saturday evening to get on the air and try a hand at the New Jersey QSO Party. It was a disappointing experience. First off, the bands seemed to be pretty dead. 20 Meters had nil signals on it; and 40 Meters didn't sound much better. I called "CQ NJQP' and "CQ de NJ" for the better part of 30 minutes without any takers. I went scanning through the frequencies on 40 Meters and didn't hear anyone else putting out any calls for the NJ QSO Party, either. 80 Meters was slightly better. A CQ there yielded two whole contacts! K3WWP - John in PA and WB2UFV in Morris Plains, NJ. To say I was underwhelmed with my results would be highly accurate. Maybe next year will be better with more solar activity to make the bands more active. Here's hoping, anyway! I'm like most other Ham Radio ops - somewhat of a gadget freak. I like things with buttons, knobs, and controls. Problem is, I can't afford to keep up with the latest gizzmoes. So I tend to acquire the "last generation" of things to keep my gadget junkie fix going. As mentioned in a previous post, I was looking for a "new" Palm Pilot, having outgrown the features of my venerable Palm M130. It would indeed be nice to own a Palm Zire or perhaps a new Palm Tungsten E2. I settled for a "pre-owned" Tungsten E that I found on eBay for a really good price. I've been having some fun playing with it lately. I was successful in beaming over all my Ham Radio programs over to the Tungsten E. Ham Radio Reference, QSO Diary, HamPilot and Palm Globe all transferred over quite easily. Palm Globe didn't run well, though. It kept causing the Tungsten E to freeze up to the point where I had to do a hard reset of the device. Definitely a bummer, as it was a neat little program that always displayed the location of the terminator. Some of my best DX has been gotten by gray line propagation! I shake my head in amazement of how attached I've grown to my various Palm PDA(s) over the years. I started out using them primarily for logging QSOs during various portable QRP operating sessions. Now I use the handy little device for a lot more. Important procedures and facts that I need for work are stored on there. I keep track of all the hardware at work that we prepare each day and keep a log of it; so I can provide my manager with daily and weekly work totals. Of course, I also have a bunch of important phone numbers, e-mail addresses and other sundry items on there that I constantly refer to throughout the day. But this Palm, the Tungten E has fun capabilities that my earlier Palm(s) did not have. First off, I loaded a 2 Gigabyte SD memory card into it; so I have plenty of memory available to me. That being said, I searched the Internet and found a few fun freeware and shareware programs to load on. I've added a graphics program so I can store pictures of my wife, Marianne and my kids, Joey and Cara When a particularly rough day happens at work; it's so nice to be able to flip that little program on and look at pictures of the people who mean the most to me. Seeing the faces that I love definitely puts the work thing into it's proper perspective and reminds me just exactly why I put up with some of the hassles that come along. I also loaded a music player called "AeroPlayer". It was only $14.99 and now I have a built in mp3 player, or iPod, if you will. Last week I burned in some of my favorite albums (that will give you a clue as to my generation! ); or should I say CDs? I have Garth Brooks, the B52s, The Fratellis, Fleetwood Mac, Cyndi Lauper and all of my Mike Oldfield CDs on there. Who the heck is Mike Oldfield? Why, Mike Oldfield is the artist who wrote "Tubular Bells", which you might recall better as the theme music to "The Exorcist". He has a compilation of about a dozen works and I have most of them. I really like his stuff with my absolute favorites being "5 Miles Out" and "The Songs of Distant Earth". If you've never heard him before, then go look him up on iTunes. You're in for a real treat! The good thing is now I don't have to carry my iPod around anymore - only one device to tote around so I gave my barely used iPod Nano to Marianne. Then the last little program that I loaded up was a SuDoKo program. I'm not good at figuring these things out, by any means. But when I have a few spare minutes, it's a fun program to play around with. It's especially just the ticket on days when it's raining outside and I can't go to the park during lunchtime to do a little QRPing. I suppose that in a few years, when the NEXT generation of Palms come out, I'll upgrade to someone's current Tungsten E2 or E3 - their discard will become my treasure! PS - August 16th was a very important personal milestone in my life. That date marked the 10th Anniversary of my first date with a woman named Marianne Dunmyer. Things sure do change in 10 years! Marianne agreed to become my lovely wife and now we have a house, two wonderful children and various pets - I am a blessed and happy guy! I received an e-mail about this blog; which for whatever reason, has been a more and more common occurrence lately. This e-mail, however, was from a soldier who is stationed in Iraq, who happens to also be a Ham. In his e-mail, he mentioned that he is a regular reader; and that my blog is one of the ways he keeps abreast of Amateur Radio. For those of you who don't know; Amateur Radio has been shut down in Iraq due to the problems with the insurgency. Talk about an e-mail making your day! These soldiers, Marines, airmen and sailors who are serving our Country are my heroes! They have volunteered to put their bacon into the frying pan every day; just to keep your families and my family's lives safe and sound. What they are doing is of no small matter or import; and in my opinion they deserve way more than our thanks and support - WHATEVER side of the political spectrum you call home. This gentleman and his family are putting up with a lot; and for him to say that my words are keeping him entertained in some small, minute way is such an honor! To all our servicemen and women ...... THANK YOU! Keep up the fantastic work. You guys are doing a terrific job no matter what the lame mainstream media believes and makes up ...... I mean "reports". Our best to you; and our prayers are with you for continued success in your mission and a safe and quick return home to a grateful Nation. Now ...... on a completely unrelated matter; you guys should have seen the electrical storm we had here in NJ last night. I was awakened about 4:00 AM by my scared and almost hysterical dog. Jesse (picture above) is a Brittany; and he's VERY scared by thunder. It must hurt his ears. In any event, the storms passed through after about an hour or so; but until the rain finally came, we had an electrical storm like I haven't witnessed in maybe 10 or 15 years. The lightning was almost to the point of becoming continuous. The claps of thunder sounded like they were coming overhead; and several times there seemed to be no delay between the lightning and the thunder. That means the storm cell had to be located right in our general vicinity; and it was loud! I thank God for three things. A - He got us through the storms safe and sound. B - The lightning didn't cause any damage to any radio equipment. No direct hits to antennas, which were disconnected, anyway. C - My kids slept through the storms! The only comforting I had to do was keep Jesse calm by petting him non-stop for practically the whole time. I never saw a dog who was almost ready to jump out of his fur! The storms brought no relief and today's weather was hotter and stickier than yesterday. Temperatures were in the 90s, the humidity was WAY up there and the temperature humidity index was at 105 degrees for a time this afternoon. Boy, I hope tonight is a quieter night than last night. All I do know for sure is that the antennas are staying disconnected again tonight! We've entered the Dog Days of Summer. It's hot and sticky in Central New Jersey. Going outside is like entering a sauna. Humidity level is hovering in the 70% plus region. When it's 11:00PM at night, any it's still in the upper 70s outside; and my thermostatically controlled attic fan is still blowing; then you know it's HOT! There's a heat advisory posted by NOAA for the next two days. I know a lot of people hate this; but this is what I live for! I dream of this kind of weather while I'm out there shoveling snow in the Winter. I've been putting in WAY too much overtime with the new job. Not enough time for radio or any other kind of relaxation. I did jump into the Spartan Sprint tonight; just to knock loose some of the radio "rust". I made 15 contacts in about 20 minutes worth of operating. It was good to hear good friends on the air like Jim W1PID and Todd N9NE and Paul KD2MX and John K4BAI. By the way, John K4BAI is a top notch and well respected contester. I am proud and privileged to be able to call him a friend. Paul KD2MX was featured a few months back in an article in "WorldRadio" magazine about QRP contesters. Pick it up and give the article a "look see" if you get the chance. Last night was a special milliWatt Run For The Bacon QRP contest that I put together. I wish I had scheduled it better! I was not able to participate as my wife and I went to the Police concert at Giants Stadium at The Meadowlands. The tickets were purchased back in February as her birthday present this year. I knew there was something nagging me in the back of my head when I scheduled the Sprint for the first Sunday in August, way back when. It hit me just last week that I was going to miss it; and I love milliWatt contests! Maybe next year. My Palm M130 is starting to give up the ghost. I use it a lot; for work purposes and portable QRP logging purposes. There's a ton of information in there; but I've had it for a bit now and I think it's time for something newer. Not current - just newer. I can't afford current! I'll have to take a look on eBay to see what the most recent generation of Palm PDAs is going for. Then, I'll have to beam over all my information to whatever I get before this one craps out completely. I've grown so accustomed to keeping phone numbers, addresses, things-to-do, notes and various Ham Radio things on it; that it makes me wonder how I ever survived before the days of electronic PDAs. I guess this is what we call progress. I wish I could afford a current, state-of-the- art Jack Bauer kind of PDA that does everything but walk the dog for you; but that's not to be. Last night was a late night; and today was a long day at work. Time to go to bed. I'll be putting in an 11 hour day tomorrow. Today was the annual "Flight of the Bumblebees" QRP contest. Unfortunately, there were no Bumblebees flying in Central NJ, either the real or Amateur Radio varieties. The day started out hot and sticky. While going to Church this morning, stepping out of doors felt more like stepping in to a sauna, than stepping outside. Then, around Noon time, the skies exploded. A line of severe thunderstorms crept its way through our area. There was plenty of spectacular ground to cloud lightning, nickel sized hail, and the rain bucketed down at rates of 2 - 3 inches per hour. Local highways; such as Route 18, through the New Brunswick area were flooded and unpassable to local traffic. Both Amateur Radio stations, portable and permanent remained unplugged from their respective antennas for the entire day. The thunderstorms abated around 3:30 PM or so; but it continued raining until around 6:00 PM, long after the finish of the contest. So, as the famous Brooklyn Dodger fans would say ..... "Wait 'til next year!" Tonight's 20 Meter QRP Foxhunt was about as much fun as an ice pick in the forehead. I didn't expect to work Tom KV2X because Upstate NY and Central NJ are too close for 20 Meters. However, I did think I was going to have a good shot at working Dave, N0IT out in Missouri. Wrong! Dave was hovering at 229 all night long with one or two flares up to 339. I called several times; and if he heard me ...... I sure wasn't able to tell. I stuck around for just about the entire hour and a half; as hope springs eternal. I would've been better off spending my time reading a book! We (me & the family) just came back from a wonderful week up at Lake George, NY. The picture you see to the left was the scene that I was fortunate enough to wake up to each morning. I brought the K1 and PAC-12 along; but truthfully, I didn't use it that much. I delighted in the time that I was able to enjoy the company of my wife, Marianne; and our two children, Joey and Cara. It's not often that I get to give them my undivided attention without some distraction or other getting in the way. However, I did set the station up for the Thursday night QRP Foxhunt; just to get an idea of what I'd be able to hear. Unfortunately, I did not hear either Fox; but I did hear a lot of Hounds. Tom Palmer, N1TP out of Naples, Florida almost blew my eardrums out with his loud signal! It was hard to believe that the was all the way in Florida, he was so loud! I also heard a few of the other regular hounds; but after a bit, the mosquitoes and biting flies drove me indoors. The next day, while sitting at one of the picnic tables, the owner of the resort came to ask me why I hadn't set up the station more than I had. I told him that I was happy to spend the time with my family. Surprisingly, he was very generous and supportive of my Ham radio activities! He told me that if I wanted to string up something in the trees next year; that it would be alright with him! That threw me for a loop! But he had commented on how we've been decent tenants for the past years; and he has appreciated the fact that I have kept the radio activities "discrete" so as to not bother other tenants. I thanked him for the offer; but at the same time told him that I'd continue to keep things stealthy and discrete. Don't want to upset the apple cart! BUT ...... if you're ever considering a Lake George vacation; and you need a good place to stay; the consider the Stepping Stones Resort, in Diamond Point, NY. The proprietor (Chuck LaPlante) is a super guy; and he has a wonderful place. It's quiet, super clean, well -equipped to provide a relaxing, fun filled family vacation. You can check him out at: http://www.steppingstonesresort. com. Tell him that Larry sent you! He'll know! Independence Day - The bottom line. our Country and our freedom. It fluttered proudly in the breeze. So young, so tall, so proud! How many had died on foreign soil? How many sailors dead at sea? How many foxholes now are soldiers' graves? NO ..... freedom is NOT free !!! That "Taps" had meant "Amen". Of a brother, son or friend. NO .... freedom is NOT free !!! continue to bless America and our troops! and was laid to rest with full Military honors on July 3rd, 2007.
and may perpetual Light shine upon her. Here it is, the night before the birthday of the United States of America. I sit here kind of depressed; wondering what the Founding Fathers would think of their "experiment" now. We live in a country which was founded upon the notion that the people rule and that the government is but a servant. The reality seems to be 180 degrees out of kilter with the original idea. People seem to be content to let our representational republic become a "nanny state" where the government is supposed to do everything from diaper you, to feed you, to house you, to find you employment, and to finally - bury you. Where's the initiative? Where's the self-reliance? Where's the pride? I think that if George Washington, John Adams, Thomas Jefferson, or Benjamin Franklin knew what has become of their beloved idea - they would be spinning in their graves. Freedom of Speech is a joke anymore. State your honest opinion, and if it doesn't agree with the "PC Police"; then you are branded a racist, homophobe, misogynist, or some other horrible thing. A large portion of the population is always moaning and whining about the losing of civil rights; but those same people are more than happy to take away your Constitutional right to bear arms. Those same people would chastise you for shooting a bear; but give no nanosecond thought to murdering an unborn child in the womb. Where did we make the wrong turn? How did we lose our collective conscience and common sense? But yet, there is hope. Hope that the common sense of the common people will prevail. That the government will someday return to the principle of being, "for the people, by the people, of the people". Hope that we will return the common sense principles on which we were founded. Hope that the United States will once again become the "melting pot" where we celebrate the American ideals and goals that we have in common, instead of worshiping at the "Altar of Diversity" where we blindly idolize the things that make us different. Hope that we will return to being a nation that promotes a Culture of Life instead of promoting a Culture of Death. America is still the Shining Beacon - still the "City on the Hill" as the late Ronald Regan so fondly referred to us. By and large, we're still a people that believes in God and for the most part we remember who we are and where we came from. American ingenuity still exists; and we can still do things that no other country would dare try to do. By and large, we're still pretty down to earth, grounded and on the ball. But the eagle inside ...... belongs to us!" 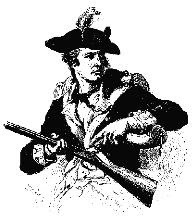 Benjamin Franklin, from the musical "1776"
I hope that this blog has piqued your interest in operating outdoors. If it has, then I have accomplished something. If your interest is indeed, piqued, but you're not quite sure how to get started; then, boy howdy, do I have an event for you! 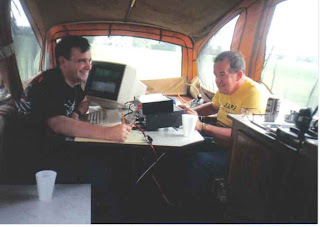 The Flight of the Bumblebees is a 4 hour QRP sprint that is sponsored by the Adventure Radio Society and takes place every year on the last Sunday in July. The idea is to get your gear out in the great outdoors; and make as many contacts as you can over said 4 hour period. Those of us who operate in the portable mode are "bees". We're given numbers that we will hand out as part of the contest exchange. This year my bee number is 63. I forget what it was last year - a higher number, if I remember correctly. Last year I operated from a park here in town; and I might do the same this year. Or perhaps, I might go up to Washington Rock Park which is in a nearby town. Washington Rock got its name because it's on a high point of the first ridge of the nearby Watchung "mountains". I use the word mountains in quotation marks because the Watchungs are part of the Appalachian mountains, which are mountains to us in New Jersey; but are merely hills to you folks who live among the Rockies! Anyway, George Washington used this high point as an observation post back in the Revolutionary War to keep tabs on Redcoat camps and troop movements. It's now a park, and there's plenty of space to set up either the PAC-12; or the NorCal Doublet as there are plenty of trees, too. However, I digress, as this post is supposed to be about you; and not me! Use this event to kick off your outdoor QRP operating experience! I guarantee that once you do, you will look for every opportunity you can to do it again. Operating QRP in the outdoors is very addicting! Hopefully, I will hear you on that last Sunday in July; and we can exchange Bee numbers and help each other rack up some points! From the post right below this one, you've undoubtedly read the notice that my friend Bob W3BBO; and two of his buddies were headed out to the field today, to do some QRPing in the great outdoors. As you can see in the photo above, of Neal W3CUV, they actually did hit the trail; and from an e-mail that Bob sent me, they had a wonderful time! Just got home a bit ago and took a shower. Whew! It got warm and the gnats were driving me crazy. I put some repellent on, but they seemed to be everywhere. You'd be proud of me, I was very careful in the sun but got a great sunburn on the back of my neck! Reminds me of my Piscataway FD pictures. Hi. Otherwise, it was a great day and fun was had by all. We made a half dozen contacts, mostly on 40 meters. 20 Meters yielded one QSO and 30 meters was a complete bust! So radio was a bit disappointing, but we enjoyed our outing. 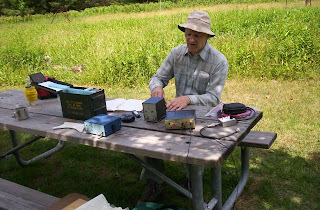 I'm enclosing a picture of Neal operating his MFJ 40 meter QRP radio. Before Dave and I left Neal and headed back to Erie, we took the short trail (1.1 mile) and I got a picture of Dave and Neal. Then as we said goodbye, a picture of Neal before he disappeared into the deep woods! He just called me on his cellphone and I listened for him on 40 meters, but nothing heard, we are just too close for 40 meters. He was in his tent and settling in for the night. Hope he makes some contacts and has a safe hike. I love stories like this! There is nothing better than getting outside and sitting under the shade of some trees while playing radio! QRP may not have been designed with this in mind; but it sure fits "hand in glove" with outdoor operating! If you've never tried it before; then I heartily recommend it. It doesn't have to be a backpack expedition to Timbuktu. either. Unhook your QRP gear from your main antenna, pack a hunk of wire and a battery and head off to your local park. A whole new facet of Amateur Radio awaits you. A day outing down to the deep woods in Warren County. As the brochure states: Hearts Content National Scenic Area, a lovely, old growth, remnant timber stand, is located next to the picnic area. Here, whispering the secrets of the centuries, stand 300 to 400 year old white pine, hemlock, and beech trees. Watch for us and hope the bands cooperate. With the "new" job; I get an hour for lunch. This is great because I've found a park that's all of about 5 minutes away from the building by car. That leaves me plenty of time to operate; and plenty of time to set up the PAC-12. I've been using the PAC-12 for the past week; and the results have been very gratifying. Yesterday, I worked Pierre VE2PID up in Quebec. Today, I had the fortune to work Robin WA4NLF in New London, NC. Robin was a solid 599 into New Jersey. He was running a Ten-Tec Paragon into an Inverted Vee. I was very happy to receive a 579 report from Robin. Robin is 50 years old and got his ticket as a High School student back in 1975. That's almost the same story as me! I'm the same age as Robin; but I got my ticket three years later in 1978. We spent our time together telling each other how we got started in radio; and before I knew it, 20 minutes had flown by! Not a super long ragchew by any stretch of the imagination; but not bad for a lunch time QSO. The PAC-12 worked flawlessly; which was nice to see. Today I set up the commercial version that I had purchased from Mike W1MT last winter. Not only does the commercial version have cosmetic appeal that my homebrewed version doesn't; but it also has the multi-band coil. All I have to do is tap the coil at the point where I get maximum band noise and the internal tuner in the K1 does the rest! And when I want to change bands; all I have to do is change the tap position, rather than change the entire coil. Much faster and easier! During the QSO, two curious park workers came by to see what I was doing. I explained to them that I'm a Ham and that I was talking with a guy in North Carolina. They mentioned that they have a colleague who is a Ham; and that they were going to tell him about me. I'll bet I get a visitor soon - probably to make sure I'm not a terrorist or spy or something! Even though it was hot (about 93 degrees) with a ton of humidity; it made for a pleasant day. Tomorrow is supposed to be about pretty much the same weather-wise. Hope I have the same amount of success tomorrow! There's another QRP thread on e-Ham. Of course, this brings out the QRP bashers. Here are some comments that really make me chuckle; and just goes to show there are a lot of Hams out there with provincial attitudes that just "don't get it". "To each his own but for me Life is too short for qrp." I tried QRP for a few years. When the opportunity arose, I bought some nicer 100-watt transceivers, good antennas, and a KW amplifier. My conclusion is that you can knock down a wall with a hammer but a wrecking ball brings better results." He tried QRP for a few years? Geez, in my last three years of operating, which has been 100% QRP, I've made over 4000 QSOs. I wonder what his problem is? 1. You don't preach about it to me with zeal, ignoring my lack of interest. 2. You don't decide that the U.S. power limit should be 100 w. and petition the FCC to change it to that. 3. You don't scream that N no. of people near me are in danger because of RF. 4. You do not operate phone below 20 meters. " Fair enough! It shouldn't be a "religion". I agree with this gentleman. The dirty little secret of QRP is they almost never contact another QRP station. The station on the other ends up doing the heavy lifting with mono banders up high and QRO power so the QRP station can hear above the local noise with their minimalist antenna. Oh man! I wish I had know this before wasting my time all these years! Hey, by the way, is this the same guy who starts all those "urban legends"? "The point is its the guy doing the receiving who is doing all the heavy lifting. Why is the goober running a watt doing all the bragging? Seems to me a guy who had a big gun tower and all the beams would understand in the case of QRP its the receiving station not the transmitting station that is dominate." Ah, yes ..... W9OY the veteran QRP basher! First on the thread to start with the derogatory name calling too! I guess it takes a "goober" to know a "goober"! "The solution (which never fails) is to put your amp in bypass and turn your exciter PA pot down to ~5 w., maybe less if you have a really good antenna, and let the QRP station do some work. Every time after one or two exchanges, you'll get, "Have to go, dinner's ready" or "I have a tv show I want to watch now." 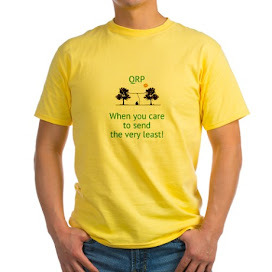 Tell him you're giving QRP a try too and watch how fast the honeymoon turns into divorce." Darn! After his first post, I had such hopes for this guy! This post just goes to show that even when they try to be civil, QRP bashers just can't help shooting themselves in the foot. Geez, if I had a nickel for everytime I have worked another QRPer, I'd be able to afford that K3! "On every QRP, "I worked this DX station" brag page, it should be required to list what the guy at the other end was running. 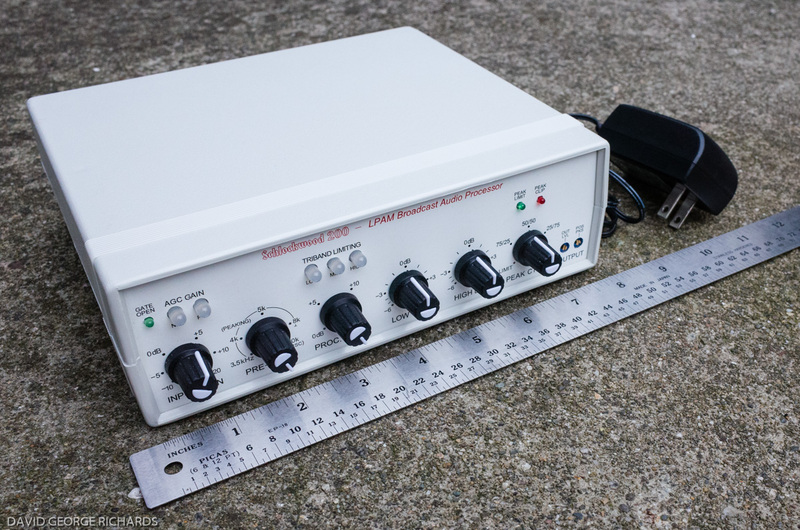 I would just love to see the percent QRP to QRP contacts. I really enjoy reducing my power to the level of the QRP station that calls me, and switching to a dipole. Chances are within a minute or two he is signing out. I Guess it is no fun digging my S9 signal that just went to a S2 out of the noise." Another veteran e-Ham QRP basher heard from. Another QRO guy that not only "doesn't get it"; but also shows he doesn't know what he's talking about. "I just don't understand why QRP'ers keep patting themselves on the back and talk about honing skills and blah blah blah. 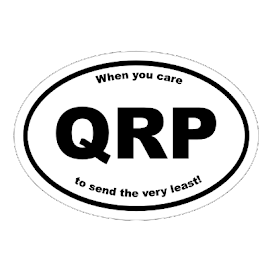 Any contact a QRPer makes he should be thanking the station on the other end for pulling his weak signal out of the noise. QRP stations do NONE of the work then claim ALL the credit." Tell us how you REALLY feel, okay? I love these guys! They're so single minded, so cocksure of themselves; that I guess they don't realize how stupid they sound. So much for keeping an open mind and exposing yourself to all that Amateur Radio has to offer! You might have heard the bug-a-boo (sorry about the pun!) being raised for the past month or so, by the "drive-by" media, about the supposed "disappearance" of honey bees. Supposedly, honey bees have disappeared from about 17 states or so. They just aren't; being seen in the numbers that they used to be. Of course, the experts have to hypothesize and come up with theories. The theories I have heard so far blame the disappearance of honey bees on global warming (what else is new ..... hey, maybe we can bring back Y2K as a scapegoat) and one idiot even blamed the increased use of cell phones! While mowing the lawn today, I think I hit upon one of the real answers. As I was going up and down my front yard, I was looking up and down both sides of my short street, at my other neighbor's yards. A lot of these folks spend a lot of money on Lawn Doctor and services like that to create lawns that look more like lush green carpets from the Emerald Isle, rather than ordinary suburban yards. I throw down some Scotts Turf Builder Plus 2 once or twice a season to keep the dandelions down. Other than mowing on a regular basis, I let nature take its course. Yeah, my lawn isn't going to make the cover of "Better Homes and Gardens" and I'll probably never make it on to HGTV, either. My lawn is full, it's green, it hardly has any dandelions or crabgrass; but I do have one thing that I noticed a lot of my neighbor's lawns don't have. I got clover !!!!! I have a veritable ton of those little white budsy things popping out between the Kentucky Blue Grass or whatever kind of grass it is that makes up my lawn. And you know what else I have? I got honey bees visiting each of those little clover blossoms looking for nectar so they can make honey! Lesson learned - goes crazy with Lawn Doctor or go overboard with chemicals so that your lawn looks magazine perfect and you're going to chase away the honey bees. If there's no clover for nectar; what self-respecting honey bee is going to waste time coming to your lawn? Seems kind of simple when you think about it - doesn't it? Now is this the total answer to the disappearance of the honey bees? Probably not; but I'll bet is a goodly part of the problem. Again ...... look up and down my street. Out of 10 front yards, I see clover blossoms on only three or four of them. I'll bet years ago EVERYBODY had clover mixed in with their grass and didn't even think twice about it. It's only now, that your front lawn has to be this shee-shee designer looking green carpet that we realized we have a problem. Do you want to help with getting the word out about Amateur Radio? Would you like to let people know how much fun; and how useful this hobby is? Would you like to perhaps inspire a non-Ham to the point where said person buys a license study guide and gets his/her ticket? Start a Ham Radio Weblog; or "blog" as they are known. You know ...... what you're reading right now! Just out of curiosity; I Googled "free blog" and I was blown away! From Blogger, which is this site here, which I use to WordPress Cafe, there seem to be HUNDREDS of places that are willing to host your blog for FREE! What self respecting Ham doesn't get off on the word "free"? I know, you have a million excuses. "I don't know how to write, I don't know what to say, I don't know where to start." You start by signing up for one of these free Blogging accounts; and then you start writing about what excites you the most about Amateur Radio. Do you like DX? Talk about it! Do you like homebrewing? Write about it! Do you like packet APRS and weather station activity? Tells about it and share your enthusiasm !!!! Or even better yet, start the ball rolling by telling the world how you spent Field Day 2007. People LOVE to read about that kind of stuff! Worried that people will think you're some kind of nerd or geek? Let 'em think what they want! Besides, check out some random blogs out there. Some of the stuff you'll find is enough to curl your hair! At least you'll be writing about something decent and wholesome; and perhaps it will be enough to help balance out all the other "crap" you can read about. You don't have to be Ernest Hemingway to do a Ham Radio blog. Heck, just think of this as typing a letter to a bunch of friends you don't even know. I have no formal writing experience; other than what I learned in school. I rely on the spell checker a lot! What I'm trying to say is that I'm nobody all that special. But if I can do this, you can too! Too technical? For crying out loud, if you're a Ham and you're reading this, you're already involved in one of the most technical hobbies there is! And if you can read this; then you have enough computer skills to "roll your own". Bottom line? You have no excuses! So I issue the challenge and throw down the gauntlet! Start your own Ham Radio blog and let me know about it. Once you've done it; either leave a comment here or send an e-mail to w2lj@arrl.net. I will add your blog to my fledgling "Blog roll" both here and on my Website. Amateur radio is infectious! Let's spread the word by letting people know what we like about our wonderful hobby. To the right is a photo from a PARC Field Day past. I think this was Field Day 1997 or maybe 1996? It was the middle 90s or there abouts. The picture is of yours truly on the left; and Bob W3BBO on the right. Bob's doing the heavy lifting by working the stations; and I'm sitting there logging. What was cool was that Bob and I didn't have to talk much during our Field Day stints together. He'd work a station; and I'd listen as he would maneuver the paddles or twiddle the dial on yet another "search and pounce" session. He'd work a station and he'd just start giving me the particulars; when I would say "Got it" or "Already logged" or something like that. Bob is such a good CW op! I did my best to keep up with him; and on a good day (a VERY good day) I could hold my own for a while until my brain cramped up and my ears started bleeding from listening to CW at a rate slightly higher than I was comfortable copying. This year, I really hope I get a chance to get some operating time in. The weekend promises to be busy, as usual. My son Joey has a swim meet tomorrow morning; and when we get home there are the inevitable chores ........ grocery shopping, mowing the lawn, etc, etc, etc. If I get a chance to operate at all; it will probably be for only a couple of hours from the patio. I want to set up the commercial PAC-12 I acquired over the Winter and see how it plays. I bought it from Mike W1MT who contacted me about it through a third party who had read about my success with the homebrewed version that I have. I got a superb deal on it; and this is the version with the "all bands" coil. Now when I want to change bands, all I have to do is move a tap rather than swap out entire loading coils. I'm looking forward to playing around with it; in anticipation of taking it with us to Lake George this summer. In any event, please make sure to listen for W2LJ on the bands tomorrow or Sunday. I could use the contacts to boost my QSO total for the year! The 2007 Summer 20 Meter Foxhunt Season is fast approaching! And we are in need of QRPers to volunteer for Fox duty! This summer, the hunts will run on Thursday evenings beginning on July 5th and will run until September 9th. This will provide us with 10 weeks of Summer QRP Foxhunt fun and excitement. There will be, as usual, two hunts per Thursday evening over the ten week period. A bare minimum of 10 volunteers is needed, however, the more the merrier; and we will consider all who offer to volunteer. Please consider volunteering ESPECIALLY if you've never tried before! You are guaranteed to have the time of your life! Tally Ho! Let the hunts begin! This coming weekend is Field Day; and unlike last year, it's NOT looking to be a washout! Looking at weather.com (The Weather Channel) and the forecast is for partly sunny skies with a high of about 79 - just a tad cooler than normal for this time of year. I'll probably set up on the patio in the backyard with the K1 (or maybe the K2), a battery and perhaps I'll set up the NorCal Doublet as a sloper using my Black Widow fishing pole as a mast for one end. In any event, since my wife is working on Saturday, I will not be visiting the Piscataway Amateur Radio Club's operation at the Piscataway EOC during the day. I got to thinking about all this because I had a nice QSO with Dan Romanchik KB6NU on 40 Meters tonight. Dan is very active in his local club in Michigan; and he's really enthusiastic about introducing the next generation of prospective Hams to Amateur Radio. He told me that he's going to have a 10 year old and a 14 year old participating as CW ops this year. That is so cool! You can read about Dan's exploits by visiting his blog. I've put a link up to it on he right hand edge of this page. You can click on it and go directly there. I read in the newspaper that Don Herbert A.K.A. "Mr. Wizard" had passed away last week. I would be remiss if I didn't mention him in this blog. "Mr. Wizard" was always one of my favorite programs as a kid. I used to watch in rapt attention as Mr. Herbert would explain electro-magnetism; or combustion, or some other scientific principle. I even enjoyed watching the newer shows on Nickelodeon during the 90s. I can't help thinking that the show had a lot to do with piquing my innate fascination with things scientific; and in a way, lead me towards such hobbies as Amateur Radio. For me, "Mr. Wizard" was the Discovery Channel and Science Channel of my youth. Rest in Peace, Don ...... you were a man way ahead of your time. Thank you for all the enjoyable hours of TV programming; and for providing me the impetus to go and learn about things on my own. Lunchtime QRP operations from the new work QTH have been, to say the least, discouraging. Since my first successful attempt back on June 5th; I've been getting skunked pretty continuously. I made excuses ...... low sunspots, low activity; but too many days went by where I didn't hear ANYTHING! So I decided to do some cogitating and try and reason the situation through. Then it hit me like a ton of bricks! I looked up into the sky at the eastern edge of the parking lot, to notice high tension lines. Funny, but I never really noticed them before. In an industrial park setting, they seem like just part and parcel of the landscape. I guess they were masking all the signals that I thought weren't there. So what to do? I wasn't about to give up so easily without a fight. This morning, before heading off to work; I fired up the computer here at home and went to the Google page. I typed in my work address on Google Maps and zoomed out a bit. Hot dog - I found just what I was looking for! Not more than five minutes away by car is a very big, wide and open municipal park. I skedaddled there over there at lunch time; and got down to business. There were several nice groves of trees complete with BBQ pits. Unfortunately, no picnic tables but for today I was able to deal with it. I brought out my backpack containing the K1 and all the amenities and also, the PAC-12. Operating from a park this beautiful meant going in amongst the trees and not sitting near the car to depend on the Hamsticks. The groves are open enough where there's plenty of space; but yet no worries about being too secluded that it makes you feel uncomfortable. Setting up the station and turning on the radio revealed almost no hash or white noise! And I was greeted by a 579 CQ by Jim WD4NVH in Alabama. Wow! We had a brief QSO until QSB did us in; but things sure were better operating from the park. I hope to get there everyday this summer that the weather is decent. On a side note, Serendipity must have been with me. As I left the park, I noticed that I had been in the Joseph Medwick Memorial Park. For those of you who don't know, Joseph Medwick was better known as "Ducky" Medwick who played with the St. Louis Cardinals "Gas House Gang" of the 1930s. Ducky was born in Carteret (the town I work in); and so the park was named in his honor. My two passions - baseball and Amateur Radio brought together. Hmmmmm, I sense a new commemorative QSL card design needs to be come up with! RF pollution is maddening !!!! RF pollution is maddening! It ruined my evening last night during Run For The Bacon; and it reared its ugly head again tonight. Last night I was able to copy all of two signals. The local noise was 10 over 9. I gave up after a half hour of pure frustration. Tonight started out a lot better. I was having a QSO on 40 Meters and the band noise was normal. Fortunately, it was at the END of my QSO when someone flipped a switch and the 10 over 9 hash came back with a vengeance! I don't know what it is that is causing such horrendous interference. It's not anything in my house as the kids were asleep and my wife was working. I had nothing inside the house turned "on" that could generate so much noise. This noise HAS to be coming from a neighbor's house. A plasma TV perhaps; or a device like it? It's not going to be easy to identify. Even harder will be explaining to the neighbor how his appliance is screwing up my radio! I did indeed have a fun morning attending the Raritan Valley Radio Club Hamfest today. The day started early by meeting Bob W3BBO and John N3ZAS for breakfast as a local diner, called the Fountain Bleu here in South Plainfield. Over some French Toast, pancakes, waffles, ham and eggs (not all consumed by me!) we caught up on old times. We were expecting a few other Piscataway Amateur Radio Club members to join us; but unfortunately that never materialized. I was greeted by a happy surprise as Bob handed me a CD on which he had copied every photo he has that he had of PARC related activities, taken while he lived here in Central NJ for a few years back in the mid 90s. I've gotten the chance to peruse the photos and the memories they have brought back are priceless! What a Father's Day gift! We headed on over to the Hamfest proper; and proceeded to look around for various items needed. In the end I didn't buy anything; but Bob did pick up a new SLA for his K2 that we found a vendor selling for 5 bucks (How can you beat that?). He also picked up some terminal strips and various little odds and ends. John picked up a Clear Speech speaker with DSP that he found, basically brand new in a box. He was looking for a decent microphone; but ended up not finding one. I was hunting for some good wire cutters and a small bag of PL-259s; but didn't find anything at a price I liked. What I did come away with was priceless, however. I saw a lot of the guys from PARC and had a good time renewing old friendships! I saw a neat example of a loop antenna for what appeared to be 20 meters suspended from a Black Widow fishing pole. I have one of those and it appeared to be an excellent rendition. I only wish that I had been smart enough to bring along my digital camera to have taken pictures of it. It looks like it would indeed have been an excellent Field Day type of antenna. I ended up having to leave kind of early as I had a Knights of Columbus function that I was responsible for early in the afternoon. Bob stayed on at the Hamfest a little longer, only to get a drive back to his hotel from another friend and PARC member, Bill W2BT later on. I drove John N3ZAS back to the hotel parking lot, where he jumped into his car and drove home. I got home only to be greeted by a message on the answering machine, imploring me to come and straighten out a mess at the K of C Council Hall (sigh!). It was fun seeing Bob W3BBO, John N3ZAS, Rich W2PQ, Bill W2WK, Bob W2UDT, Marty KB2JSG, Bill W2BT and Brian N2MPM. There are some others that I wish were there; that hadn't showed up in the small amount of time that I was able to spend. Maybe next year! And now that my term is up as an officer in the Knights of Columbus, I think I'll be able to make Piscataway Amateur Radio Club meetings on a more regular basis. I don't get to make a lot of Hamfests. Usually, there's some activity that my kids are involved in; or there's some other kind of previous commitment that always seems to rear its ugly head when I want to attend one. But this coming Saturday is one of the few that I try to make every year. In Central New Jersey, it's known as the "Dunellen Hamfest". It's held in Piscataway now; but it still goes by its old moniker. It is actually the Raritan Valley Repeater Club Hamfest. It's one of the better local ones and I'm looking forward to it. My nest Ham radio friend Bob W3BBO is driving over from Erie, PA for the weekend for a visit; and we'll be meeting for breakfast and attending the fest together. It's been years since we've seen each other even though we keep in close contact with one another. This will be special. I don't really need to buy anything special. I can always use PL-259s and wire cutters (I always seem to be hard on wire cutters!). I probably won't end up spending more than 20 bucks. But I am looking forward to the morning out in the fresh air. The weather is supposed to be beautiful! This coming Tuesday night is the June edition of the NAQCC Monthly Sprint. The top two highest scoring NAQCC members (in the Simple Wire Antenna category) will win book about keys by Dave Ingram K4TWJ, who is also an NAQCC member. I've plastered these notices to just about every CW and QRP mailing list on the Internet that I can think of. 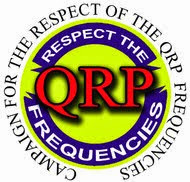 I'm posting it here also; just in case you're a loyal reader who does not subscribe to any of the QRP or CW forums. This Tuesday evening, the North American QRP CW Club will be holding its monthly sprint. (Remember that's Tuesday evening here in the USA) That's 8:30 - 10:30 EDT, 7:30 - 9:30 CDT, 6:30 - 8:30 MDT and 5:30 - 7:30 PDT. 40M - 7039-7050 kHz (Avoid W1AW on 7047.5 kHz). A particular station may be worked once on each band. Operate CW only. All licensed amateurs are invited to participate, but only those operating QRP (5 watts or less) are eligible for awards. RST - SPC (State Province or Country) - NAQCC Nr. QSO with a Member, 2 points. QSO with a Non-member, 1 point. All multipliers count only once in the contest. If you use only a straight key for the entire sprint, multiply your score by 2. If you use only a bug for the entire sprint, multiply your score by 1.5. If you key with anything other than a straight key or bug, there is no bonus multiplier. SWA - simple wire antennas - for those using a simple wire antenna per NAQCC definition. GAIN - gain antennas - for those using other than a simple wire antenna. This month the top two NAQCC highest scorers in the Simple Wire Antennas category will win prizes! First place wins Dave Ingram's wonderful book, "The World of Keys" while the second highest placing NAQCC member will earn a copy of Dave's book, "Keys II: The Emporium". Dave K4TWJ is a 'card carrying" member of the NAQCC and we thank him for his generous donation of one of the books. The other book was procured using funds donated to the NAQCC. All entries must be RECEIVED before 2400Z on June 19, 2007. So submit as soon as possible, especially regular mail entries. Tonight's QSO has me dreaming about being on vacation! I called CQ on 40 Meters tonight, to be answered by Hal, who is on vacation at the Outer Banks in North Carolina near Kitty Hawk. He was running a KX1 at 3 Watts to a 120 foot hunk of wire and he had a great signal! 10 dB over 9 (at times) great! It was a very pleasant QSO; but now I have visions in my head of operating the K1 from Lake George. Summer is almost here; and vacation time is around the corner. Ham and cheese for lunch ? Well, now that I think about it ..... that IS what I had for lunch today - a ham and cheese sandwich. But the other kind of "Ham" that I'm more interested in could best be described as "dessert". After scarfing down my sandwich, I went out to the car and fired up the K1. As the Spirit that controls the Aether would have it, as soon as I got the station ready to go, I was greeted by the dulcet tones of a station calling CQ on 20 Meters. It turned out to be Herb, WØHM out of Shakopee, MN. The conditions weren't terrible; and they weren't the greatest, either. QSB was rolling in and out fast almost giving signals a kind of fluttery feel. Not like Polar flutter, exactly; but on the same vein. It turns out that H and M are Herbs two initials; but just look at the call ....... WØHM. How great is that for a Ham radio callsign! The very first principle that you learn when studying basic electronics is Ohm's Law. I wouldn't mind having that call even if H and M weren't my intitials !!! The QSO lasted about 15 minutes. Not what you would call a long ragchew; but enough to supply my radio "fix" for the day. Herb was using an Icom IC-706 to an Inverted Vee and I was using the K1 to a Hamstick mounted on my truck. Herb is 57 years old and has been licensed for about 24 years now. After exchanging a few more pleasantries, we had to give it up as QSB was getting deeper with the faded periods lasting longer and longer. Also, I had to start getting back inside to work; so we bid each other 73 and called it a QSO. Geez, I hope the weather is pleasant again tomorrow so I can give this another shot. Maybe tomorrow, I'll pop on the 40 Meter Hamstick to see where that takes me! Today, June 1st is the official opening of this year's hurricane season. If you believe the groundhogs among us (you know the type - afraid of their own shadows! ), then this year is going to be a busy one. Undoubtedly caused by Global Warming, of course. Ahhhhhh ..... Global Warming, the cause d'celebre of the decade of the 00s. I'm no climatologist; but when did we become SOOOOOOO arrogant as to believe that we humans are the end-all-be-all cause for everything that happens on this planet? Now I don't doubt that Global Warming is real and exists ....... I just don't think that we humans are the cause of it. I believe that global warming is a natural cycle in ecological scheme of things. As Hams we should be really in tune with the sun. We're so darned aware of the 11 year sunspot cycle; and we're all bemoaning the fact how crappy band conditions are at the bottom of it. We can't wait until we're out of the bottom of it. So why can't there be a normal cycle of temperatures? The sun can't heat up and cool off a few degrees in a cyclical fashion, just like sunspots ebb and flow? As a species, we've been measuring the temperature of the earth for what ...... 400 years or so? And from that pitiful sample, we're supposed to be experts on climate change? What a joke! One last thought ....... if we're so responsible for climate change; then how did the last Ice Age come to an end BEFORE the invention of the SUV? Really folks ...... get real! But I digress. The weather has been sultry and summer like in NJ the past two weeks. (Probably due to Global Warming. Doh!) The bands have gone into their summertime behavior pattern. (Pattern ...... suggests a cycle ...... I better be careful here!) 80 and 40 Meters are filled with static crashes; but unfortunately the low sunspot count is making sure that the ionosphere barely "excites" and 20 Meters is pretty useless once the sun goes down. So while 40 Meters seems to be the best band propagation wise during the night, the static is punishment on the ears and brain. The sunspot low has been predicted to occur anywhere between last March and this coming September, depending on who you listen to. In either event, once we pass through the nadir, sunspots should start appearing again pretty rapidly. From this blog to God's eye! Did you feel it? There were rumblings throughout the Amateur Radio and QRP worlds today! The epicenter was in Aptos, California and shock waves are still being felt throughout the Amateur Radio community; and probably this will continue right throughout the time of Dayton Hamvention. 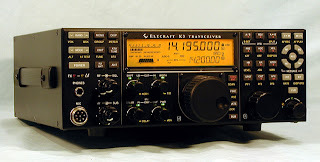 Today, Elecraft announced the new pinnacle of its line of Amateur Radio transceivers as they rolled out the K3! This afternoon at the DX Convention in Visalia, CA, we unveiled a new top-of-the-line transceiver -- the Elecraft K3. This is the culmination of three years of design, test, and refinement, and we believe the K3 will set a new standard for performance and value in its class. It has features and performance comparable to present radios ranging from $4000 to $12000. There's also an order form that could be printed and mailed, but sometime on Monday the on-line order page will be up and running, which is the preferred method. As explained on the order form, you can reserve a K3 now for initial shipments in July. A 50% deposit is requested if you'd like to secure one of the first 200 production units (serial numbers 20-220, probably). modular, no-soldering, kit (this is the subject of the next email). If you have any questions on specifications, performance, etc., that are not answered by the data sheet, feel free to email wayne@elecraft.com. We'd also like to express our thanks to our very patient 15-member focus group. Over a period of about a year, they endured a never-ending series of concept drawings, refinements, and feature discussions. They're a distinguished bunch! I'm sure you'll hear from some of them as the K3 is discussed at length. Finally: thanks to all of you who have generously contributed ideas for a hypothetical K3 during our many on-line "fishing expeditions." You had wonderful input, and I hope we've created the radio you've always wanted.